Zambian Chronicle | … Because Zambia Is Greater Than Any Single One Of Us!!! Source: What is Bridge Funding & Hard Money Lending? WASHINGTON, D.C. – June 25, 2009 – The United States African Development Foundation (USADF) has signed a grant to support farmers in Zambia. The grant will benefit the Kadande Farmers Group (KFG) located in Chama District. KFG is an organization of farmers who grow rice and other crops such as maize and groundnuts, providing a market for the agricultural products its members produce. The organization has identified a high demand for its rice but cannot meet those demands due to its limited production, storage, and marketing capabilities. The eighteen month grant will be used to finance improvements to its financial systems, development of a business and marketing plan, trainings in improved agronomic practices, and purchasing milling equipment. USADF began programming in Zambia in 2003. Zambia’s current portfolio stands at twenty-one investment projects totaling nearly $4.6 million dollars. For more information about the portfolio, please visit the country’s quick source page at http://www.adf.gov/USADF-QuickSourceCountryPortfolioPage-Zambia.htm. The United States African Development Foundation (USADF) is a United States Government agency dedicated to expanding access to economic opportunity in Africa. Currently USADF operates in 20 African nations. Over the past 25 years, USADF has funded nearly 1,500 projects representing in excess of $150 million in support of African enterprises and local African communities. For more information on USADF, its programs and application guidelines, visit www.usadf.gov. LUSAKA, Zambia — As the gleaming black Mercedes-Benz pulled up to the courthouse, an aide rushed to the passenger door, bowed deeply and then ceremoniously opened it. A foot, finely shod in a dove-gray shoe, appeared, followed by the rest of the man, Frederick Chiluba. For a decade, he was president of Zambia. Now, more than seven years after he left office, a court is deciding whether he stole from his impoverished people. A verdict is to be announced July 20. As common thieves and drug peddlers milled about, Mr. Chiluba strode through the corridors to his hearing, shaking hands, smiling magnanimously, throwing an arm around a co-defendant to chuckle over a private joke. Amid men in dingy shirts and worn trousers, he was impeccably dressed in a double-breasted charcoal suit, with a red silk handkerchief peeking from his breast pocket and a gold, diamond-studded watch glinting at his wrist. But once he was in the dock, his jovial demeanor evaporated. In the thin, sickly light that filtered in from narrow windows one recent morning, Mr. Chiluba replied somberly when the magistrate asked why his lawyers had failed to present a written summation on time. “I wasn’t aware, your honor, until today that the submissions are not made,” he said. Mr. Chiluba is a rarity in Africa, a Big Man brought low by corruption charges. He says he has done nothing illegal, but his many critics say his fall was brought on by the usual sins of the powerful — greed, vanity and pride — and a major tactical blunder: he underestimated the man he hand-picked in 2001 to succeed him as president, the plodding, diligent lawyer Levy Mwanawasa. Mr. Mwanawasa died last year after an illness. But his pursuit of Mr. Chiluba outlived him. Even as Mr. Chiluba awaited his judgment, his wife, Regina, was convicted on corruption charges in March and sentenced to three and a half years in prison. Mr. Chiluba already faced a London civil court judgment in 2007 in a case brought by Zambia’s attorney general. He is still contesting the payment of damages. “He should be ashamed,” Sir Peter wrote. The judge concluded that though Mr. Chiluba had a salary of only about $10,000 a year during his decade in office, he spent more than $500,000 in a single shop, Boutique Basile, in Geneva. “The president (unlike the emperor) needs to be clothed,” Sir Peter archly noted in his judgment. The shop owner, Antonio Basile, testified last year that payment for the clothes sometimes arrived in suitcases stuffed with cash. The goods are now stored in battered metal trunks by Zambia’s anticorruption task force. There are piles of designer suits, monogrammed dress shirts and elegant ties, silk pajamas and dressing gowns. But most remarkable are more than 100 pairs of size 6 shoes, many affixed with Mr. Chiluba’s initials in brass. He is just a little over five feet tall, and each pair has heels close to two inches high. They are a riot of color and texture: jade-green lizard skin and burgundy suede, cream-colored ostrich and lustrous red silk. As his second term drew to a close, Mr. Chiluba claimed that a popular clamor had arisen for him to stay in office. A third term would have required amending the Constitution. But by then, Mr. Chiluba, a former trade union leader elected as a reformer, led a government renowned for corruption. Civic groups and churches organized to stop him, and succeeded. Not long after he withdrew from contention, The Post, an independent newspaper, quoted a member of Parliament as saying that Mr. Chiluba was a thief. The state pressed charges of criminal libel against The Post’s editor and the politician. The legal maneuver backfired. Mutembo Nchito, the brash young lawyer representing The Post pro bono, effectively put Mr. Chiluba’s integrity on trial. He won access to records of the intelligence agency bank account in London, and discovered evidence of generous payments to Mr. Chiluba’s children, the boutique and even the chief justice of the Zambian Supreme Court, among others. “You never expect to find a smoking gun,” he said in wonderment. But before Mr. Nchito could introduce the bank records in evidence, he needed President Mwanawasa’s permission. Mr. Mwanawasa, who could have cited national security to hush up the scandal, instead gave Mr. Nchito permission to use the records, led an effort to strip Mr. Chiluba of immunity and named Mr. Chona to head the task force on corruption. Mr. Nchito was hired to prosecute criminal charges against Mr. Chiluba, who was accused of stealing about $500,000. The task force, now headed by Maxwell Nkole, has won convictions against Ms. Chiluba and former military commanders, among others. Mr. Mwanawasa not only pushed the prosecution of a leader from his own party but also, in the final months of his life, sharply criticized President Robert Mugabe of Zimbabwe for his violent repression of the opposition there. Despite his staid manner, Mr. Mwanawasa proved himself a maverick, challenging the patronage politics and tolerance for authoritarian rule that have marred many postcolonial African nations, historians and analysts say. Mr. Chiluba, in unsworn testimony earlier this year, expressed outrage at what he saw as Mr. Mwanawasa’s rank betrayal. 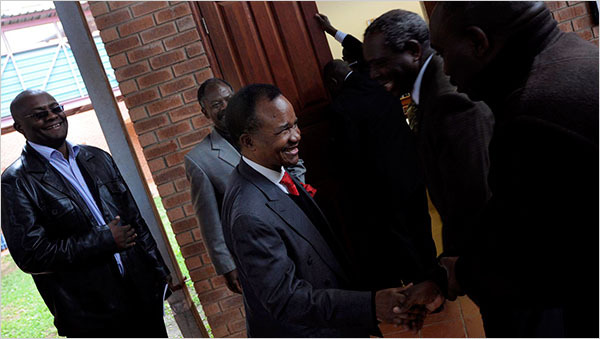 After the recent hearing, Mr. Chiluba walked quickly to his Mercedes, waving off questions with a flick of his hand. Back in the courtroom, Moffat Kabamba, a skinny 21-year-old in windbreaker and sneakers, followed Mr. Chiluba into the dock. He was charged with swiping a cellphone and a bicycle. He mournfully confided that he had decided to confess because he was guilty.